The OSCE Special Monitoring Mission has reported its failure to receive information about casualties of the Donetsk explosion that claimed the life of the head of the self-proclaimed Donetsk People's Republic (DPR) and his bodyguard. "Following the explosion on Pushkina Boulevard in Donetsk city on 31 August, on 3 September, the SMM continued to observe a calm situation in the city center (non-government-controlled). The SMM followed up on reports of people injured in the above-mentioned explosion. While at the Kalinina morgue in Donetsk city on 3 September, the SMM was informed that the bodies of Aleksandr Zakharchenko and another member of the armed formations (a member of Zakharchenko's personal security detail) had been brought to the facility with fatal wounds from the explosion," the mission said. "On the same day, at the Gusak Hospital in Donetsk city, medical staff told the SMM that after the explosion on 31 August six people had been admitted with various blast-related injuries, however, they refused to provide the Mission with further details," the mission said. "On the same day, medical staff at the Kalinina Hospital in Donetsk city refused to provide the SMM information about people injured in the explosion on 31 August without permission from senior members of the armed formations," it said. 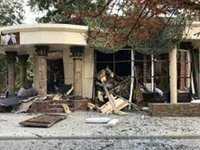 The OSCE said in its report on September 1 that monitors heard the sound of the explosion at the Separ restaurant in a park near 13, Pushkina Boulevard, in Donetsk at 5:27 p.m. on August 31.